Our compact Matrix HDMI Switcher is perfect for small systems, auxiliary viewing rooms, or any other application where a 4-Input, 2-Output Distribution System is required. 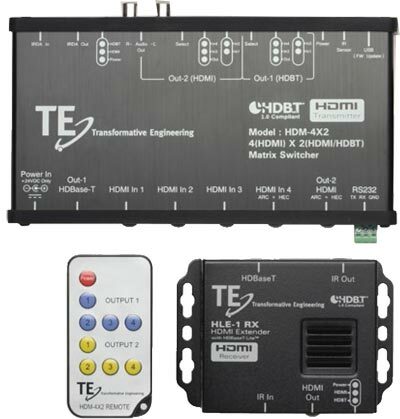 Output #1 of this switcher incorporates a HDBase-T Transmitter for reliable transfer of the selected signal to the display. We include a matching HDBase-T Receiver, which like all our Extenders, is powered from the Transmitter. Output #2 is a standard HDMI connector, used for a local display. 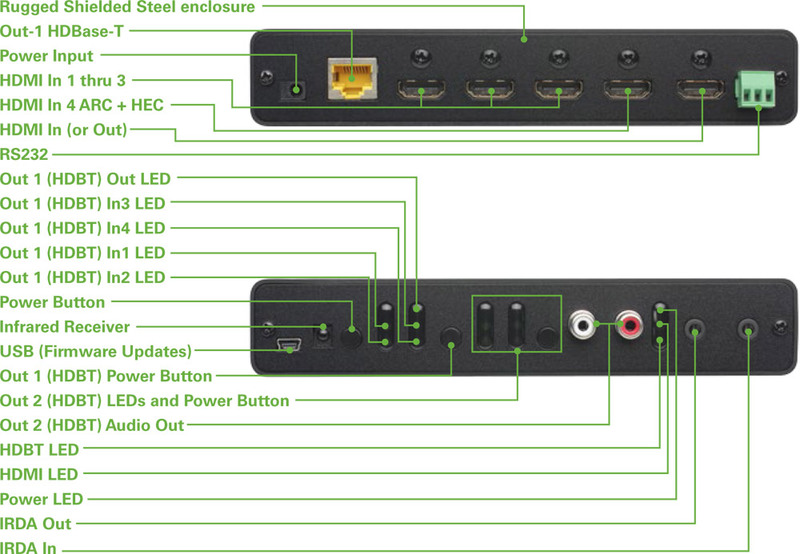 Among the rich features of this product, we include Audio Take-Off for Output #2, Audio Return Channel (ARC) between Output #2 and Input #4, Bi-Directional IR for the HDBase-T pathway, IR control of the switcher (Remote included), as well as RS232 control of the switcher. We provide discrete IR commands as well as RS232 protocols for operation. A miniature USB port provides the ability to update the switcher’s firmware, if necessary. Output # 1 features IR Bi-Directional Pass-Thru with Power Option. We give you the choice of pure-pass IR or Powered Pickup System at either end. Compatible with industry standard products. Adapter included for non-standard configurations.